"And I - I have shown him ... that a man without hope is a man without fear." The definitive Daredevil tale, by industry legends Frank Miller and David Mazzucchelli! Karen Page, Matt Murdock's former lover, has traded away the Man Without Fear's secret identity for a drug fix. Now, Daredevil must find strength as the Kingpin of Crime wastes no time taking him down as low as a human can get. WHY IT SHOULD WIN: Could have picked a variety of Daredevil books. The Bendis run is great. The Brubaker run is great. The original Frank Miller run is great. But this is one of Rusty's all time personal favorites. It’s one volume too and self contained so that makes it a little easier. It was originally published as issues 226-232 of the Daredevil series in 1986 and Frank Miller came back to really finish what he started a few years previously. It’s a Kingpin story. It’s a Karen Page story. It’s a Hell’s Kitchen story. And it’s awesome. 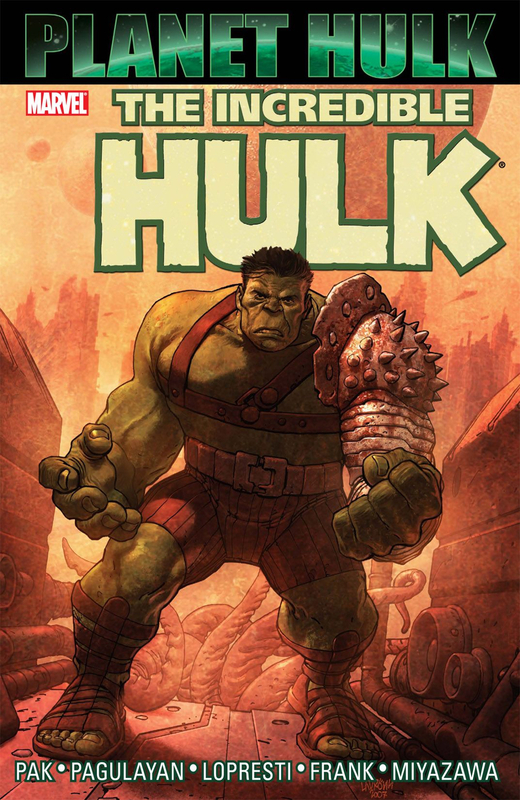 Planet Hulk or Daredevil: Born Again? Experience a new kind of Iron Fist story, steeped in legends and fables stretching back through the centuries! Orphaned as a child and raised in the lost city of K'un Lun, Danny Rand returned to America as the mystical martial artist Iron Fist - but all his kung-fu skills can't help him find his place in the modern world. After learning the legacy of the Iron Fist holds more secrets than he ever dreamed, Danny is invited to fight in a tournament against the Immortal Weapons. At stake is the life of his friend, the legacy of his father and mentor - and the future of K'un Lun! WHY IT SHOULD WIN: Matt Fraction and David Aja again. They created the modern Hawkeye and they get credit for creating the modern Iron Fist. Another somewhat throw away character that has been totally revitalized. They tell how Iron Fist came to be and all about the lost city of K'un Lun. They even goes back centuries and tell you the history of the Immortal weapons. Forget the tv show. Read this. Civil War or Immortal Iron Fist? The Vision wants to be human, and what's more human than family? So he heads back to the beginning, to the laboratory where Ultron created him and molded him into a weapon. The place where he first rebelled against his given destiny, and imagined he could be more - that he could be a man. There, he builds them. A wife, Virginia. Two teenage twins, Viv and Vin. They look like him. They have his powers. They share his grandest ambition (or is that obsession? ): the unrelenting need to be ordinary. Behold the Visions! They're the family next door, and they have the power to kill us all. What could possibly go wrong? Artificial hearts will be broken, bodies will not stay buried, the truth will not remain hidden, and the Vision will never be the same. WHY IT SHOULD WIN: We had to get a Tom King book on the list. Know who he is? He writes Batman. He writes Mister Miracle. He wrote the Swamp Thing Winter special that just came out a few weeks ago. He’s probably the hottest new writer in the last 5 years! And Vision is what really drove him to national prominence. It got him the Batman jig! Which is probably one of the five best jobs in comics. Anyhow Vision did start it all. The Vision trying to be a normal human? The vision trying to lead a normal family life? Not you’re normal superhero book and Tom Kings not your normal writer. Breathing life into a family of synthezoid’s. As only Tom King can. Fraction. Aja. Hawkeye. Kate Bishop. Cars. Guns. And videotape. The breakout star of this summer's blockbuster Avengers film, Clint Barton - a.k.a. the self-made hero Hawkeye - fights for justice...and good rooftop BBQs! And with ex-Young Avenger Kate Bishop by his side, he's out to get some downtime from being one of Earth's Mightiest Heroes! WHY IT SHOULD WIN: Hawkeye the useless guy with the bow and arrow, reinvigorated into the superhero that everyone can relate to. It’s a guy, in this case Hawkeye, trying to live his life as normally as he can and running into problems. Hawkeye’s got girl problems. Hawkeye’s got landlord problems. Hawkeyes got bad guy problems. Hawkeye’s just got problems. Matt Fraction and David Aja are able to create a type of comic that had never been seen before. And if you look at the Marvel books being produced today. Numerous, numerous titles have their art and storytelling style based on this title. They’re not as good. But if imitation is the sincerest form of flattery. Hawkeye wins. Hawkeye or Old Man Logan? DC COMICS, IMAGE COMICS, EVERYTHING ELSE!